Great ideas for how to tie the Theme into Booth development, community investment, t-shirts, mascots, photography, a banner recognizing sponsors, etc. Commercial Sample for those interested in Videography & Acting! Students discuss design elements in preparation for the 2017 BEST Competition. •6 week breakdown in 3 minutes! Group manages the Robot, Notes, Teambuilding, Photography, Videography, Building, Tools, etc. from receiving Box of materials to arriving at Competition Day! 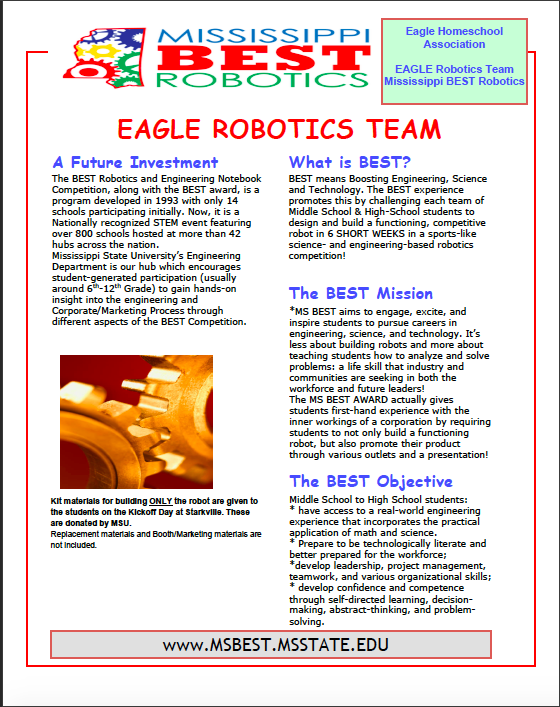 Checkout this STUDENT generated Website for a Texas-based BEST Robotics Team. For those interested in the MS BEST award that places special attention on the Booth, this video shares BOOTH ideas from their 2011 Bug Escape-Theme. The sky (*and our budget) is the limit to the creativity that students can display! Photos show Motor, Servo Kit, Control System and Power components. *For those working with the Robot/Engineering Notebook. *Note that these items may or may not be compliant or included this Fall. This is to give a general idea of consumable items from last year's box of materials. *Target Audience is the Robot and Engineering Notebook Teams. This PDF gives an idea of how each aspect of BEST is scored at MSU. This is the Engineering Notebook Scorecard used at the 2017 Crossfire BEST Competition. Used at the 2017 Crossfire BEST Competition. Great way to view what the judges are looking for and how they are tallying the scores. This would be important for the Programming Team working with the Robotics/Engineering Notebook. Great way to see what the judges are looking for and how scores are calculated. This scoresheet is important to the Booth/Display Team (but may involve various contributions from other groups as well). Great way to see how judges calculate scores and what elements they are looking for in displays, community outreach, and interactive information. -An inside look at how and what was evaluated during the BEST competition last year. What Team Do You Want to Be a Part Of? PDF file contains sample Photographs with a brief description. 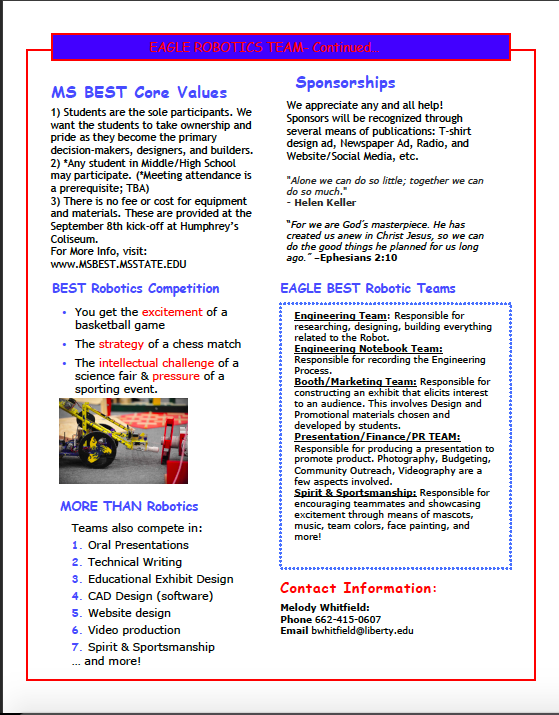 -For Students interested in the Engineering/Design/Tech Teams: Logo, Robot Design/Production/Programming Team and Engineering Notebook. -For Students interested in the BEST Award Booth Team: Marketing and Design.